This was my first time making Shepherd's Pie. I don't even know if I've ever really had good or traditional Shepherd's Pie before but Jenn has gotten me hooked on Hell's Kitchen which in turn got us watching Kitchen Nightmares and Gordan Ramsey has saved a couple of restaurants with his Shepherd's Pie so I figured I needed to try and make some. I even flipped through his cookbooks at the bookstore and didn't see his recipe anywhere so I turned to the internet. 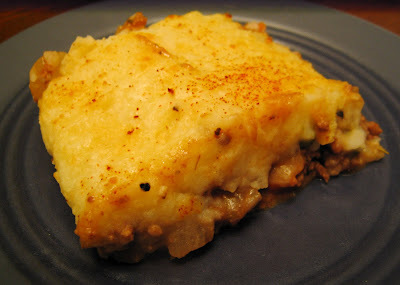 I started with Alton Brown's Shepherd's Pie recipe and made a few minor modifications. Mainly because I forgot to get a few of the ingredients while at the grocery store and had to use what I had at home. When it comes down to it, Shepherd' Pie is an all-in-one meal that is inexpensive and hearty. It's basically your meat and vegetables topped with mashed potatoes and baked. To start you peel your potatoes as you need smooth mashed potatoes to cover the meat mixture. Then cut them into pieces to boil more quickly and boil them until soft and set aside and keep warm. Then, heat your vegetable oil and throw in your onion until it's soft and starting to brown. 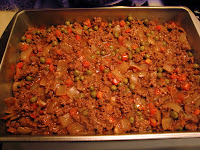 Then add your ground meat and some garlic and spices and start to cook the meat. After it started to cook nicely I added the chicken broth, flour, tomato soup, and Worcestershire sauce to create the meat mixture. At first it was pretty watery but I cooked it until some of the water boiled off and the sauce thickened. I figured it shouldn't be too watery. Once it was thickened I added the vegetables. You should preheat your oven to about 400 degrees and make your mashed potatoes. Mine were just milk, minced garlic, salt and pepper stirred together until smooth. Then you layer your pan with the meat and vegetable mixture on the bottom and seal it in with a layer of mashed potatoes. I spread the potatoes over the meat and then topped it with a little Parmesan cheese and ground cayenne pepper to help it get a nice browned top when baking. Alton's recipe called for around 25 minutes in the oven and I figured I'd put it in for around 20 or so and finish it off under the broiler... Unfortunately our broiler decided not to turn on last night so I just set the oven up to 500 degrees towards the end and turned on the oven light and played darts (yes my dartboard is in my kitchen) until it started to brown. In the end I was very happy with the outcome. The meat mixture was juicy but not watery and very tasty and the mashed potatoes had a nice crunch to them at the top with a little bite from the cayenne pepper and it didn't fall apart when I tried to plate it. If I do this again, I will try to do it with lamb instead and hope my broiler is working!